Will 2015 be the year of the HealthTech IPO? The Health Information Technology for Economic and Clinical Health (HITECH) Act of 2009 planted the seeds for the disruptive environment we are witnessing today in healthcare. Physicians’ use of EMR/EHR systems increased from 18% in 2001 to 57% in 2011. In 2014 this number has increased to over 85%, following the “2013 year of EHR replacement”. Now that most providers have EHRs in place they are working towards the Affordable Care Act incentives to reduce costs, increase price transparency and increase efficiency. The companies that help health care providers achieve these goals are the companies that are most likely to IPO in the HealthTech space. Key signals for an imminent IPO are Late-Stage investors, high customer retention rates with low acquisition costs, S1 filing and large profit margins. The timing of an IPO also depends on how sell-side fund managers feel about the Healthcare IT industry as a whole. Steven Kraus, partner at Bessemer Venture Partners believes there will be four to five healthIT IPOs each year for the next five years. Castlight Health (CSLT), price transparency health app, IMSHealth (IMS), healthcare analytics and consulting firm, and Imprivata, single sign on software all had their IPOs in 2014. Castlight received some flak from the media for being overpriced and to some appeared to be an indicator of a tech bubble. 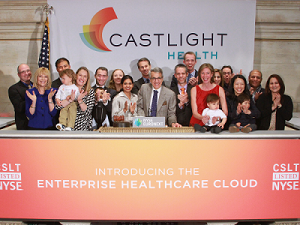 Castlight had a 1.4 billion dollar valuation with 13 million dollars total revenue. The company started trading at $39.8 and is now trading at $11.70. There are a lot healthcare technology startups with amazing ideas, however many struggle to earn a profit. There has been five times increase in venture investments in digital health, however most digital health companies are not profitable. Venture Capitalists have typically strayed away from healthcare companies because of uncertainty in regulations and the difficulty of earning a profit in healthcare. “The strength of investors’ interest in digital health is based on several factors, government policies such as healthcare reform, payment reform and the federal incentives to adopt electronic health records have created a welcoming climate for entrepreneurs to try new models,” Steven Kraus said in an interview with Modern Healthcare. There has been a 6.5 billion dollar investment in digital health in the past 5 years, which signifies that some venture capitalists have changed their mindset toward healthcare technology companies. IMS Health was the second largest IPO of the year, raising roughly $1.3 billion selling 65 million shares at an initial price of $20 a share. At the close of the market on Dec 31, IMSHealth was trading at $25.64. Impravata (IMPR) had an initial price of $16.25 and at the end of 2014 was selling at $13.00. Impravata raised $66.3M from the sale of 5 million shares of stock, nearly equal to its revenue of $71.1M in 2013. Impravata’s single sign on application allows more than 2.8 million providers to decrease the amount of clicks needed to view their EHRs. There are several Health IT companies that could IPO in 2015 including: Practice Fusion, Doximity, Healthgrades, Evolent Health, Best Doctors, ZocDoc, and AirStrip. Practice Fusion, founded in 2005 is a free MU2 web based EHR. The company has raised 157.5 Million dollars from 27 investors including KPCB, Founders Fund and Qualcomm. It has 112,000 monthly subscribers that equate to 81 million patient records. Earlier this year Practice Fusion hired Robert Park, who helped Chegg go public as its CFO which could indicate the company plans to go public soon. Doximity is a networking site , “Linkedin for physicians”, hailing over 40% of United States providers (300,000 physicians) as members. It is also the largest HIPAA-secure medical network in the country allowing providers to freely discuss patients and their labs via secure messages. It was founded in March of 2011 and has raised a total $81.8 Million from Emergence Capital Partners, Morgan Stanley, T. Rowe Price, Morgenthaler Ventures, InterWest Partners and DFJ. Last year Doximity surpassed the American Medical Assoication to become the largest physician group in the United States. Doximity was created by the founders of Epocrates (EPOC) and therefore members of the team have experience with an IPO. HealthGrades, founded back in 1998 ranks providers and hospitals and has more than 250 million hits a year. It utilizes a subscription based model where consumers pay for access to the physician ratings. In 2010, Vestar Capital Partners took the company private, but it could possibly go public again soon. Evolent Health aids providers in switching to value based payment systems. It was founded in 2011 and has raised 101.3M in private equity and had a revenue of 40M as of January 2014. Evolent Health earned 4th place in America’s Most Promising Companies: The Top 25 of 2014. Best Doctors, founded in 1989 provides expert physician opinions to employees and designs and implements health plans for individuals and families. Each sector of the company, the physical advice and health plans contribute equally to the company’s revenue. It has large Fortune 500 and Fortune 1000 companies as customers. Best Doctors has raised $45.5M in private equity from Brown Brothers Harriman and $20M from Nippon Life Insurance Company of Japan. ZocDoc, founded in 2007 is a website that allows patients to schedule appointments with their providers online and read reviews of providers by real patients. ZocDoc has received $97.9M from 5 rounds of funding, notable investors are Goldman Sachs, SV Angel, Founders Fund, Jeff Bezos and Khosla Ventures. AirStrip delivers critical patient information to a provider’s tablet, smartphone or computer. It has received 65M from 4 rounds of investors. Notable investors include Sequoia Capital and Qualcomm. Other notable companies that could IPO or be acquired in 2015 are Vitals, MediMedia, Emdeon, AmericanWell, Redbrick Health Corp, Proteus Digital Health, 23andMe, One Medical Group, Health Catalyst, Grand Rounds, Zenefits, TelaDoc, Welltok, naviHealth, Oscar Health Insurance, GetInsured, Health Essentials.